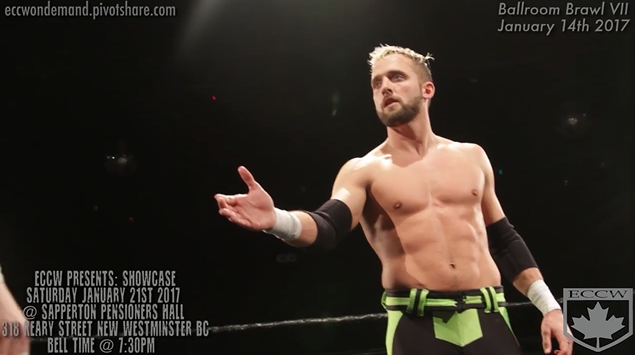 This was an open challenge match for Phantasmo’s ECCW Championship. This wasn’t bad, but it was hard to watch without feeling like it was a missed opportunity to produce a super hot match. Phantasmo’s entrance in ECCW made him seem like a total star. Kyle got a great reaction for being a surprise opponent. The makings were there for a super heated bout. They chose to forgo the dynamic clearly just waiting for them and proceeded to have a really drawn out contest. There were some good moments of course, and the story worked broadly as the outsider vs. local champ. This entry was posted in ECCW and tagged El Phantasmo, Kyle O'Reilly on January 14, 2017 by TJ Hawke.